The ¼ cup habit is simple and transformative. You base one meal each day on ¼ cup of whole grains. That means grains that are whole. Not processed cereals. Not wholefood bars. Not wholemeal flour or pasta. Not grains that are pearled or rolled or puffed or flaked. You can eat those things whenever you like, but they are not part of ¼ cup. Adding ¼ cup of unprocessed whole grains to just one meal each day lets you slightly overshoot the recommended minimum intake (48g of whole grains) in a single bound. And that makes the rest of the day easier. It also reduces your risk of heart disease by up to 30 per cent and steadies blood sugar. Your ¼ cup meal could be breakfast, lunch, dinner or a substantial snack – whatever works best for you. 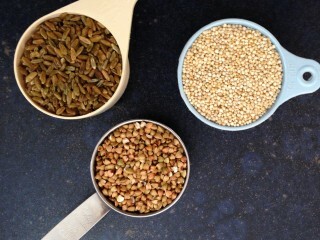 When time is short, opt for quick-cooking whole grains like millet, quinoa and buckwheat. For slow-cooked braises and stews, sturdier grains such as whole spelt, wheatberries, rye, barley and oats (yes – whole oats!) work best. When you are cooking for more than one person, or want to make a dish that will last a few days, simply multiply the number of ¼ cup scoops you use accordingly. Note that ¼ cup applies to uncooked whole grains. If you are measuring whole grains that have already been cooked, the volume is greater. Different grains vary in how much they swell on cooking but trebling is typical, so assume ¾ cup of cooked grain per person or portion. You can even cook whole bags of whole grains and freeze them in ¾ cup batches. Guess what: that’s the basis of a really satisfying, sustaining and nourishing meal. You will feel terrific when you do this. We post helpful recipes here, and you can follow them on Twitter using #quartercup.